CARNIVAL TODDLER ZONE IS A GREAT WAY TO ENTERTAIN THE WEE ONES! 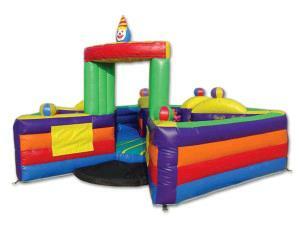 THE ENTIRE UNIT IS A BOUNCER WITH JUMPY STATIONS THE TODDLERS CAN HOLD ONTO WHILE JUMPING. **NOTE: CARNIVAL TODDLER ZONE BOUNCER IS FOR KIDS 3-4 YEARS ONLY. APPROX DIMENSIONS: MEASURE L 16'X8'W 17'X10"H 9'X6"
* Please call us for any questions on our carnival toddler zone bouncer rentals in Rocky Mount and Wilson NC.